Wow. Thank you all so much for your anniversary wishes via comments, emails and Twitter. This is obviously a special day - but you made it so very special. Thanks! Is that a cupcake hiding under there?! Yes, it is! Not only is it a key lime cupcake...it was also free! You know I've done this before...but I felt like today called for a cupcake celebration, so I just couldn't resist! 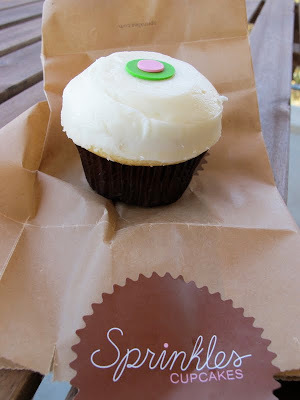 After I saw Sprinkles tweet that the first 50 people to whisper "Season 3" (in regards to the new season of Cupcake Wars on Food Network) at any location would receive a free one, I just had to go see if luck was on my side. I actually left my wallet at home, so I was pleasantly surprised that I scored a free one. Well, I'm off to continue this celebration. I do believe wine is on the agenda...woo! Hope you have a great Monday night. What's your stance on frosting?! One of my best friends (hi, Sarah!) isn't obsessed with it like I am...it blows my mind. The more the better in my book!